With vitamin E. Softens, smoothes, relieves rough, dry skin. Daily skin therapy. Smoothes marks & tones skin. Dermatologist recommended. 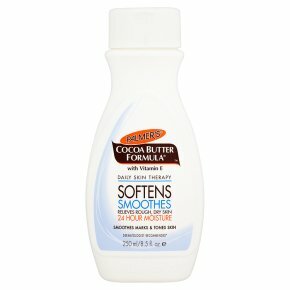 Pure cocoa butter & vitamin E. Provides 24 hour moisture. Suitable for eczema prone skin. Soothes skin after sun exposure. Fast absorbing. Softens & relieves skin. Smoothes marks & scars. Paraben free & phthalate free.Rich, luxurious Palmer's®Cocoa Butter Formula®daily body lotion provides deep hydration all over. This velvety soft formula absorbs quickly, creating a protective barrier that locks in moisture. From normal to dry to extra dry skin, this emollient rich lotion effectively softens and relieves, leaving skin smooth, supple and beautiful. Dermatologist recommended* *3 out of 4 dermatologists recommend Palmer's®when recommending cocoa butter.